On February 28, 2002 as Gujarat was scarred, profoundly and irrevocably, through well-planned and meticulously executed acts of violence, one space in the heart of Ahmedabad, Gulberg Society, saw 70 persons massacred. For over six years, we have together resisted the sale of this once living housing society to hawks from among the criminals. Today the space lies vacant but is crowded with battered memories. Through deeply depressing moments, made worse by excruciating legal delays, we needed something positive, something energising and lasting to focus on. This idea of resistance emerged out of tragedy and gloom, but more particularly, it was born of the close emotional bonds with each of the victim survivors, our family. On February 28 each year we meet for prayers and remembrances. We now want to do something more. We know that there will be bumps and roadblocks on the road ahead as a vindictive state tries to thwart us at every juncture. We also know that this idea, one of a kind, must be located in Gujarat. (There is only one such resistance museum on the Indian subcontinent, in Bangladesh.) We know too that this idea will become a reality. Part of the battle against the state will be the building of a movement for the Gulberg Society Museum of Resistance with support from each and every one of you. We need you. We need your ideas. For the victim survivors of Gujarat 2002, for those of us at Sabrang Trust and Citizens for Justice and Peace (CJP) who have devoted the better part of two and a half decades to battling the forces of communalism, hatred and division, this will be a unique effort, the first of its kind. All the documentation, the posters and the films that we have accessed and archived, including our own, will be housed in the Gulberg Society Museum of Resistance. Narratives of survivors, of victim communities, will enjoy a special focus here. As a people, we need to have the courage to look the causes and effects of hatred and violence in the face. A vigil will be held at Gulberg Society on February 28, 2008 to commemorate six years of the Gujarat genocide of 2002 and to formally inaugurate this idea and movement. For nearly six years now, more than a hundred thousand survivors of independent India’s state-sponsored carnage in the western Indian state of Gujarat have been denied dignified acknowledgement of, or reparation for, the magnitude of indignity and violence they suffered. With the BJP’s recent electoral victory in the state, the pain and humiliation of the victim survivors has been further exacerbated. A quiet yet dignified and firm resistance to this state callousness and impunity lies at the heart of this idea of resistance. 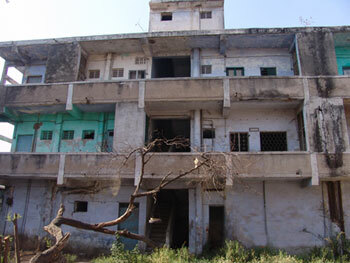 Located in the heart of Ahmedabad city, Gulberg Society, Meghaninagar, the scene of a daylong massacre in which 70 persons were killed, offers the site for this resistance. Waiting for justice, for six long years the survivors have withstood selling out to hawkish buyers who would be happy to obliterate any visible public memory of the carnage. This idea offers us all, private citizens, foundations and entrepreneurs, the opportunity to build a professional institution that energises the survivors and human rights defenders who have stood by them. Located in Gujarat, this museum of resistance will map the many and varied instances of communal violence and victimisation over the decades – be it the Kashmiri Pandits in the valley or the Muslims of Jammu & Kashmir, the Sikh survivors of 1984, the voices of survivors from Meerut or Bhagalpur – all victims of violence, regardless of community, will find a space and a voice here. Be it Gulberg Society, Meghaninagar, Ahmedabad, Naroda, Sardarpura or Odh, these locations, which saw orgies of violence, stand as ghostlike relics even today. In their damaged and scarred walls cracked by ravaging flames, the tiny blocks, apartments and homes within Gulberg Society show evidence of the depth and scale of the violence unleashed therein. Room after room and home after home in this society will be sombre reminders to us all, supporters of the resistance, of the horrors unleashed by communal violence. From the ashes of these bitter memories will emerge a deeper understanding, along with programmes and activities that will themselves give shape to the resistance that we are trying to build. The Gulberg Museum of Resistance will be a professionally built institution of resistance to acknowledge the horror and scale of intercommunity conflict that has plagued independent India and will house detailed documentation of the same. Victim survivors will be the soul and centre of this museum of resistance and will, on February 28 each year, commemorate the day with prayers and remembrances. Films, documents, art and literature on the subject will be available on the site, which will become a live centre of activities for the anti-communal movement in the country. Once the project is complete, no one will be able to visit Ahmedabad city without revisiting what transpired here in 2002. For this to happen and to ensure safe passage of sale to the survivors, we are inviting contributions to help make this vision a reality. Contributions should be made to Sabrang Trust, Mumbai. These will be publicly displayed in a scroll of honour. We invite you to donate generously towards this idea. Hailing from India’s largest religious minority, Gujarat's survivors today live in hope of justice that has, in most cases, been delayed if not denied. Nineteen of Gujarat’s 25 districts were torn apart by bitter targeted violence that left 2,500 dead. To date, of the total of 413 'missing’ persons, the remains of 228 have not been found. Four hundred girls and women were victims of sexual violence. More than 1,68,000 persons were turned overnight into internally displaced persons by a remorseless administration. In all, 23,873 homes were seriously damaged or totally destroyed. A total of 14,330 shops and informal businesses and 1,100 hotels were irretrievably damaged. Six years later, the victim survivors face a denial of justice and pathetic compensation. Of the 566 mosques, dargahs, madrassas and churches specifically targeted in the violence, 167 have still not been repaired. Few were repaired through state funds, a vast majority through community funding.